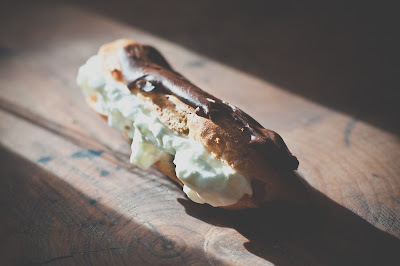 *Be warned once you make these and see how easy they are you may just develop a full blown eclair addiction. Up until last month I'd never made choux pastry, thinking it would be far too faffy for the likes of me and my "throw everything in a pan and see what happens" approach to cooking. Well not only did I manage to forget my recipe book when I went to make them, but when I found one at work I managed to get the recipe wrong and still ended up with 15 amazing eclairs. I've been using my accidental recipe ever since and it works every time, I still haven't gotten round to using the actual recipe from the book yet. When it comes to fillings and toppings I've kept it dead simple here but you really can go wild with your flavours. I can't recommend the ace book Secrets of Eclairs by Marianne Magnier-Moreno enough. It's an entire book dedicated to eclairs which covers all the basic fillings like chantilly cream, crème pâtissière and chocolate mousse but then also includes recipes like salted butter caramel, rose, earl grey and caramelised apple eclairs, believe me you want to try the salted caramel eclairs! I use a food mixer to get everything really fluffy so I end up with a very light, crisp puffed pastry but you can use a hand mixer or simply good old fashioned arm power and a whisk. Preheat your oven to 200C. Put the water and butter into a saucepan and heat gently until everything is melted, give it a stir to mix together, take the pan off the heat then chuck all the flour in and beat well with a wooden spoon. The mix will come away from the sides of the saucepan and form a ball. Leave the mix for 5 minutes. At this point I get a flat baking tray out and cover it with baking parchment and grease it with butter and try and hunt out my piping bag. Put your flour mix into a food mixer and beat whilst very gradually adding in your eggs until the mixture is all fluffy. Spoon your mixture into a piping bag that is fitted with a 1cm plain round nozzle then pipe lines of pastry about 10cm long making sure you leave about 5cm in between eclairs as they expand as they cook. Bake for about 20-25 minutes or until they are puffed up and a lovely golden colour then cool on a wire rack. Make your icing simply by melting your butter then whisking in the remaining ingredients. Smear over each cooled eclair, if the icing starts to harden whilst your still covering the eclairs just pop it back on the heat for a few seconds to soften then carry on until all your eclairs are covered. Pop your whipping cream in a bowl with the icing sugar and whip then split each eclair through the centre (not all the way through though) and fill with cream. Choux pastry is one of my favourite things. Even those cheapy cheapy buns you get for 99p in the supermarket - with the fake chocolate on top. I haven't quite managed to get the insides completely dry, but I'm getting there! Frankly it's easier than normal pastry. The French fib. I accidentally used self raising flour instead of the recommended plain and it works each time, definitely give this one a go, my piping skills on the other hand still need a lot of work! I made these this weekend, although I made choux buns rather than eclairs because I couldn't find a piping bag. DELICIOUS. I loaded them with cream using a doughnut syringe and they were amazing. Thank you so much for such an easy recipe! Choux pastry can be tricky, but it's definitely worth having another try!